Information here covers memory & CPU loading, hard disk temperatures, and Cable Modem monitoring. I have also used MRTG for monitoring signal levels and error rates on the EUMETCast satellite data service, for monitoring timekeeping using NTP, and for monitoring atnospheric pressure with a JeeNode Arduino-like board. File here: GetBarometer.zip. You may first need to install and enable the Windows SNMP component. 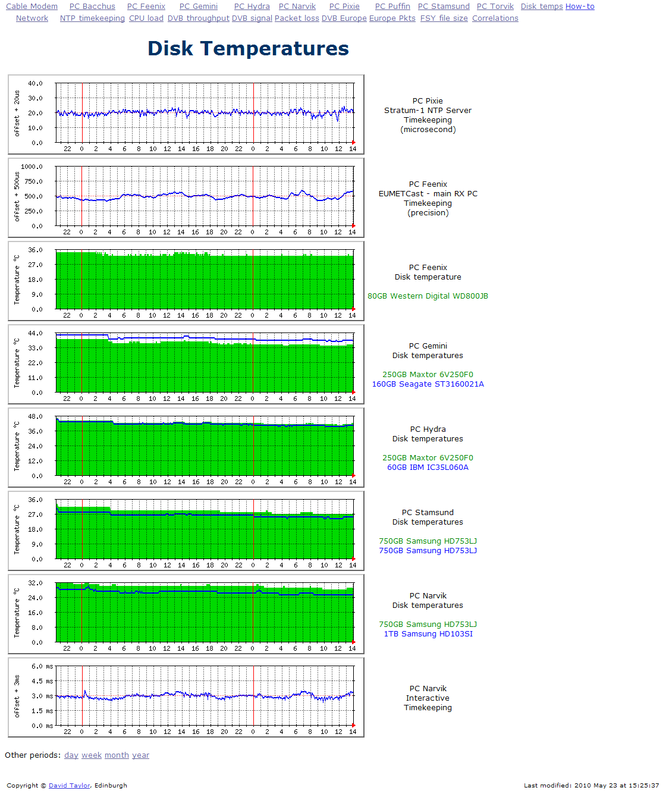 Performance and other monitoring for the Raspberry Pi is described here, and for the Ayecka SR 1 DVB-S2 receiver running EUMETCast here. I use .php Web pages for the data summaries so that I can use one page for the day, week, month and year data, simply by using a single query parameter "period", so the references become page?period=day, page?period=week and so forth. To explain this further, I have made one of the .php pages available as a text document here. As PC Narvik has two CPUs, there are two instances 48 and 49 listed in the [Target] line in the sample below. # i.e. .1.3.6.1.2.1.25.1.7.0 (check this on your system using GetIF), which returns integer 0. As this is my first attempt, any suggestions for improvements are welcome. The only thing noticeably different is using OIDs in the [Target] line, as described here, and I used the GetIF program and the MIBs from SNMP Informant to work out what to monitor. If GetIF doesn't work on your PC, you can try iReasoning MIB Browser instead (thanks to Mads Kristoffersen for that), There are a lot more parameters available from the free SNMP Informant. I added the unknaszero option so that when the PC is offline, the zero CPU and memory usage are clearly visible. If you are running MRTG on the PC which is being monitored, then you don't need to specify the name name in the Target line, you can use the loopback IP instead (127.0.0.1). With common systems now having up to 4 CPUs (well, dual-core plus hyperthreading), you may find it more helpful to plot the total CPU usage as well as, or even in place of, the four individual CPU graphs plotted on two separate graphs. SNMP Informant supports "_Total" as well as "0", "1", "2" and "3" for the individual CPU OIDs. "_Total" is represented as the six-character, counted ASCII string: 6.95.84.111.116.97.108 I have used the "localhost" IP address in the example below, rather than the PC name, as you can re-use that string on any PC! # Enter the following string all on one line. As the amount of physical memory has increased, virtual memory may now exceed 4GB, as may the physical memory in the machine and that available for use. Consequently, I have revised the object IDs (OIDs) I use for memory from those which report in bytes to those which report in kilobytes, and I multiply the result obtained by 1024 to get the actual number in bytes. It seems that the OIDs which report in bytes are only 32-bit values, whereas MRTG can work with 64-bit integers. You can seen the change here. Watch out for the MaxBytes value which you may need as well! Windows since Windows 2000 has included basic performance monitoring counters which include a set for disk usage measurement. 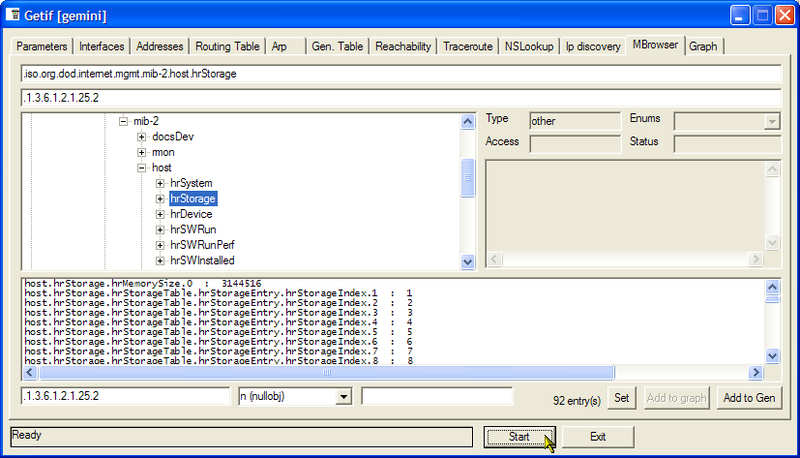 For each disk, there are at least three basic values available: disk size, disk used, and disk space units. Having the units specified separately means that to get the disk used in bytes you must multiply the disk-used by the disk-allocation-units. Fortunately, MRTG allows a target to be specified as A * B, so that's not a problem. What is slightly more of an issue is the variable number of disks, which means that as disks come and go on your system - even plugging in a USB memory stick, for example - the index in the table of disks of a particular drive may vary, at least if you have a RAMdisk or extra partition with a high drive-letter - T: or Z:, for example. I haven't discovered a way of fixing this so far, but that may just be my ignorance of using SNMP! You need to "walk the MIB" for the PC in question. To do this, download a program such as GetIF version 2.3.1 or iReasoning MIB Browser which allows this. Having installed GetIF, open the program, enter the PC's name or IP address into the Host Name box, and press the Start button. You can now scroll down the list of values to find the index for the name of the monitored volume (drive T:) in this case. Click on the entry is the list, and its description and value will appear. where the OID (object ID) is given in the last line as ".1.3.6.1.2.1.25.2.3.1.3.10", so the index is "10", and you can now scroll further down to find the corresponding allocation units (".1.3.6.1.2.1.25.2.3.1.4.10") and storage used (".1.3.6.1.2.1.25.2.3.1.6.10"). So the storage used in bytes is the product of the numbers returned from these two values (4096 * 33933 = 138989568 bytes, 133.55MB). OID1 & OID2 * OID1 & OID2. If the disk is mostly used for temporary storage such as a RAMdisk in EUMETCast use, you may want to know what the maximum use is so that you can size the RAMdisk appropriately. Remember that MRTG only takes snapshots every five minutes so you may not catch the peak, but MRTG can display (in magenta) the 5-minute peak values on the week, month and year graphs. Enable this by including the "WithPeak" line below. # Note that the following should all be on ONE line, not split at the "*"
Please note that the SpeedFan program must be running continuously for the SNMP DLL to see any data. This should not be too much of a visual distraction as the program minimises to a simple system tray icon. Note that the temperarature is a snapshot at the instant when MRTG reads the data - it isn't an averaged value over the last five minutes. Check what values SpeedFan provides holding the mouse over the SpeedFan icon - you may find one or more CPU temperatures and possibly even a GPU temperature. You need to start SpeedFan with Admin privilege, which you can do by creating a Task Manager entry to be run at login, with elevated privileges. This replaces the short-cut in the Startup menu directory. Be sure to turn off the "Stop task after 3 days" option! For use with SNMP, you actually start the program Injector.exe, not SpeedFan.exe, to allow shared access to SpeedFan's memory by the SNMP DLL. Your anti-virus program may not like you setting up shared access, so be prepared to mark Injector.exe as a known good program the first time you try this! So as the program returns the disk temperatures (of the two disks on this PC), you can plot it in MRTG like this, using the ability of MRTG to read the output of a command-line program. Here's another example, showing what happened when I replaced a 750GB 7200rpm standard disk with a 1TB "eco" disk spinning at just 5400rpm, and with a slower seek speed. While the green line is more or less constant allowing for the daily temperature changes, the blue line showing the second disk on PC Narvik has dropped significantly from being a few degrees above the 750GB disk to being a degree or three below. A lower working temperature should produce greater reliability, and it's a few watts less power consumption. Performance of the PC appears to be unaffected. The horizontal lines from before 0800 to after 1100 were the nonexistent values while the PC was powered down for the disk clone. After seeing those misleading values, I added unknaszero to the options shown above. This enabled me to capture what was possibly the hottest May day ever in Edinburgh - 2010 May 23 - and the next couple of days for comparison! Here's the screen-shot The DiskTemperatureReporter program is unpublished, but available on an as-is basis by e-mail request. It needs to be started by hand when the user logs into the PC. 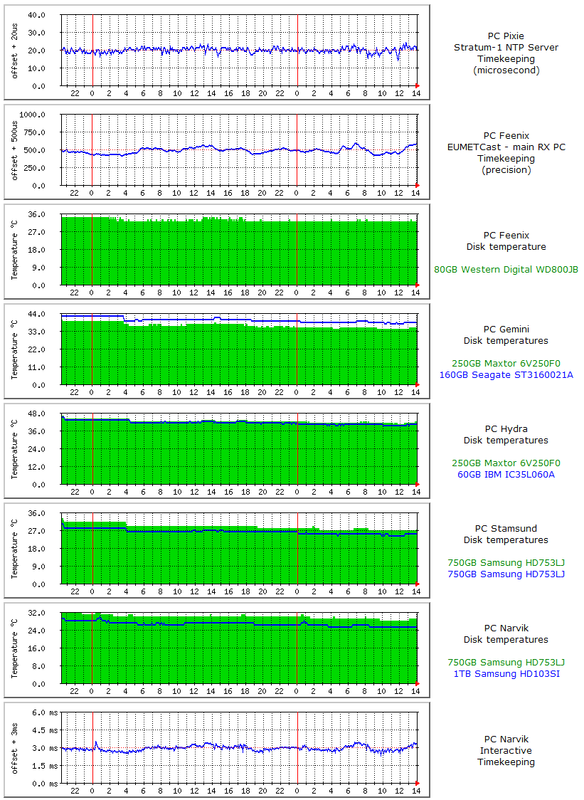 Alternatively, you could use the SpeedFan & SNMP add-on mentioned above which includes disk temperature monitoring. coupled with a simple program I wrote myself. The MRTG config lines are much like the disk temperature lines above. If you are interested in a copy of the Windows program, look here. If the product URL has changed, look for the product "USB TEMPer" on the site. Update Oct-2012: they now offer "gold TEMPer", but I don't know whether this is compatible with my software. One thing I have been playing with since June 2011 is to record the temperatures as 1000 times the actual value, i.e. milli-degrees. This has two consequences - first that the data from the probes can be recorded with greater precision. Although the probes are only accurate to within a couple of degrees, they do record the data to greater precison - perhaps half or a quarter degree C. Secondly, and perhaps more importantly, using milli-degrees allows MRTG to record a more precise average for the week, month and year graphs which are no longer limited to integer temperature values. To allow this, the program has an option to multiply returned values by 1000, enabled with the -1K parameter. For outside tempertures, which could be negative Celsius, I have decided to record Fahrenheit which are most unlikely to go negative here in Edinburgh. This is enabled with the -F option to the program. 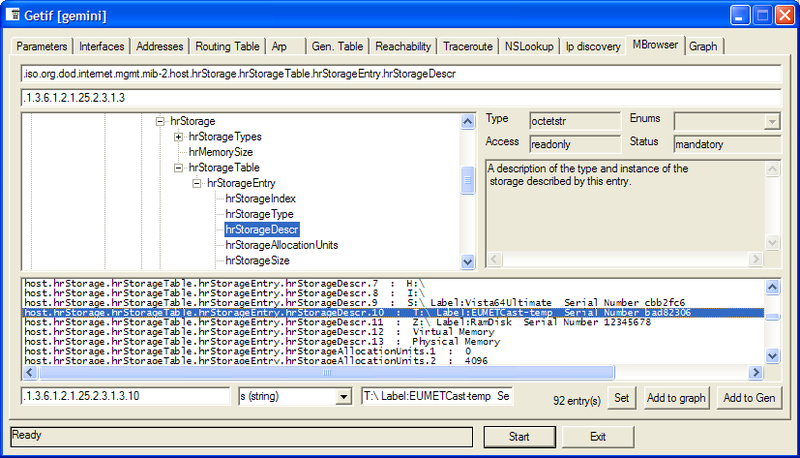 MRTG would normally display values such as 20,000 (i.e. from 20�C) as "20.0 k", where the "k" is the standard thousands units multiplier. With capital "K" also being temperature in Kelvins, this is doubly undesriable, so the display of the units multipler is supressed with the "kMG" entry (see below). To make the value displayed below the graphs correct, the "Factor" entry is set to 0.001. Fortunately, although the documentation doesn't say so explicitly, a floating point value is accepted here as the multipler. Example graphs may be found here. The only thing of note is that I put the IP address for the cable modem into my Hosts file as "cm-hfc", since my ISP only provides a dynamic IP. Since Virgin Media chose to remove any SNMP capability from their modems, I have since been using a screen-scraper program to capture the data. This has recently been updated to work with the even more inaccessible signal level information from the VM "Superhub", but stopped working again after a firmware update. You can download the program here, and comments or suggestions for improvements are welcome. To provide greater accuracy for "recent" plots, and to avoid an "off-by-one" error in MRTG which can cause an apparent drop in values over time, values reported by the program are scaled up by 1000 and divided by 1000 before plotting. Thus a new MRTG configuration file is required. 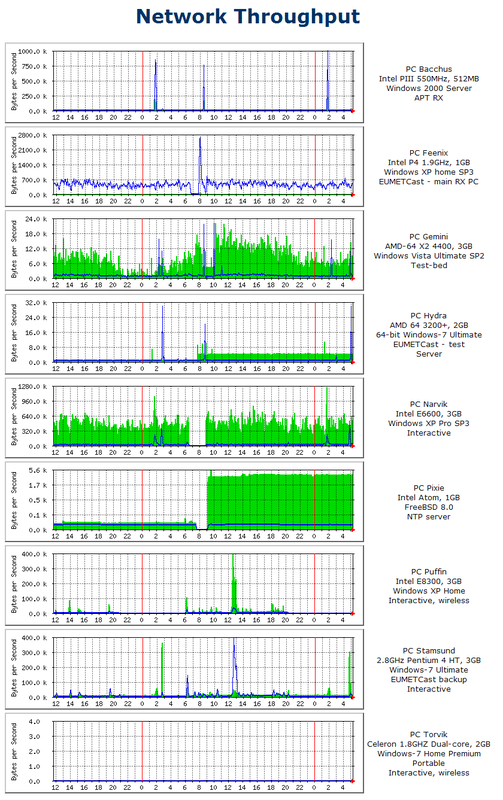 Recently I needed to compare the performance of two ADS-B receivers. Did the claimed higher message rate make any difference in practice? Were aircraft received at a greater range? I wanted a graphical comparison as I find that easiest to see the differences. Fortunately, PlanePlotter allows access to its internal state via OLE/COM, so I wrote a small piece of VBscript code to extract the data I needed, and then configured an MRTG include file to plot that data. You can see the script and include file below, warts, debugging code and all! You can see the full set of results here, and an example from PC Alta (my main uploading PC) is given below. The VBscript starts with a great circle calculation routine. Opening the PlanePlotter object, the script first gets the home location and message-rate. It then reads all the aircraft which PlanePlotter currently knows about, and gets a set of data for each. Only locally-received aircraft are wanted so the script checks that the share code starts with an asterisk (*), that the signal reported is greater than zero, and that the latitude and longitude are not zero. Having looped over all the aircraft, the script then writes the four lines required by MRTG to stdout. The code below assumes a maximum range of 500 km, and hence the maximum message rate is limited to 500 messages per second to allow a common plotting scale. Plot two separate graphs if this doesn't suit you, and remove the "500" clip of maximum message rate in the VBscript. I've left in the various debugging statements I used during testing. This is my first "multi-line" VBscript, so likely it contains some examples of bad practice, and even some errors. Have a good laugh if you are an expert, but please also tell me how to improve the script.
' VBA doesn't have an ArcSin function. Improvise. Paul Marsh (@UHF_Satcom on Twitter) kindly sent a script to monitor the number of messages sent to FlightAware on the Raspberry Pi. Thanks! I haven't said anything about monitoring network I/O as this is already covered in the MRTG documentation. I did happen to capture this screenshot, showing just how useful having monitoring on your PCs can be. In this case, I had changed the firewall on a PC, and suddenly the network input to all devices on the network shot up. Checking with wireshark on a laptop PC, the software was sending out 254 ARP packets every 120 seconds, and each packet was the maximum wire size (1514 bytes). Other ARP packets were either 42 or 60 bytes! I've report this to the developers. Acknowledgements: the SNMP work was triggered by an e-mail exchange with Lonni J Friedman who asked how I got MRTG working under Vista (answer: Run As Administrator, having added SNMP and allowed it through the firewall), but who had the performance monitoring working under Windows XP! Steve Catto first introduced me to MRTG - thanks Steve! Update: I just found this PDF document which covers monitoring a Windows system with MRTG. Local copy as the original http://www.sans.edu/resources/student_presentations/mrtg_notes.pdf is no longer online.